Dr. Skube gives keen insight into the emotional motivations behind breaking news and in-depth understanding of people who make the news. Her entertaining, concise, and compelling content makes her the obvious expert for television, print, or radio. 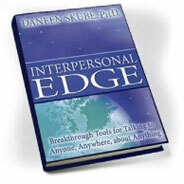 Dr. Skube is used as a subject expert on strategic communication by the television, print, and radio media. Her unique national expertise was recognized by CBS who recently placed her under a development contract. 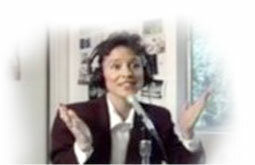 She has also been a regular guest on Northwest Afternoon and KCPQ‘s morning news. Coming soon to a computer near you will be an archive of “Workplace Guru” webisodes from Tribune Broadcasting for you to watch. 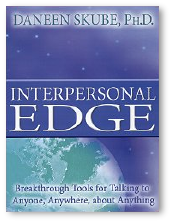 Interpersonal Edge – The BookUp til now, the cutting-edge tools in this book have only been available to management teams, high-level executives and select clients. You’ve no doubt picked it up because you want to be the CEO of your own life—with a greater sense of empowerment and confidence. Written by Daneen Skube, syndicated columnist, sought-after executive coach and innovative therapist, this practical and humorous work provides simple tools you can use today to generate influence, get immediate results and turn the lemons of life into opportunities. Readers of Dr. Skube’s wildly popular column have been clamoring for a decade for a book of this kind, which offers an in-depth look at her advice and methods. Whether you’re dealing with a backstabbing co-worker, trying to get a promotion, or want to rekindle a romance, you’ll do it all better with an interpersonal edge. The keys to the life you’ve longed for are within these pages—just add you and stir. "Sanity Seduces Succ. Off Fast Track"
Improve Your Life: Take A Quiz! "Are you mothering without losing yourself?" "Are You at Risk for Addiction?"